The leader of the village is, the seventh Hokage. Boruto is the son of Naruto Uzumaki, to become a ninja must enroll in the school "ninja academy". But the students in the surroundings see Boruto with prejudiced eyes for the thing of being "the son of the seventh Hokage". However Boruto has unprecedented capabilities. Boruto will meet new friends, and there will be an incident mystery how he will face this challenge ?, inside the heart of the whole team, now the story of "Boruto Uzumaki", begins. 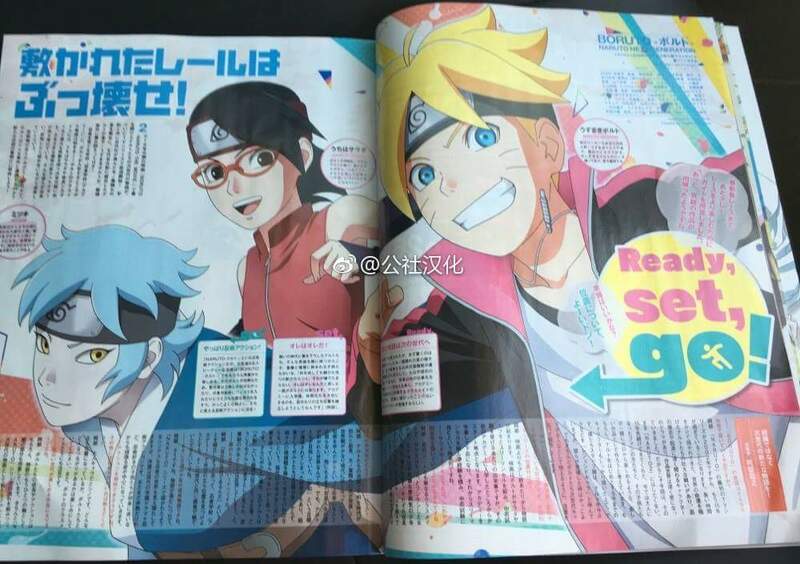 OP theme by KANA-BOON titled as "Baton Road"
ED theme by the peggies titled as "Dreamy Journey"
A girl of the same class Boruto. 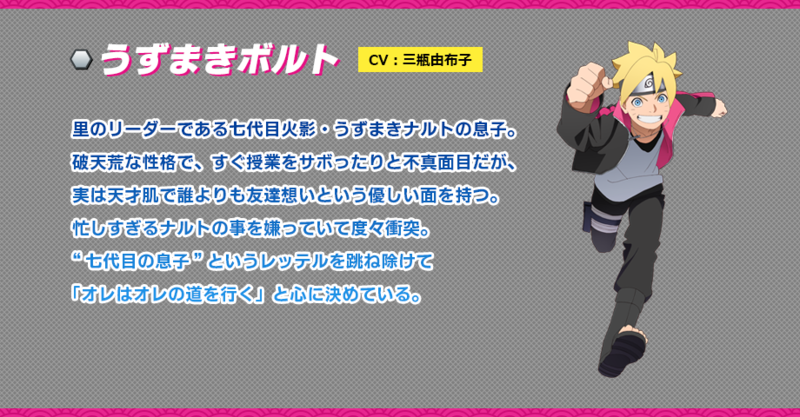 She knows about Boruto for a long time because her mother and Naruto, Father Boruto, are childhood friends. But ... For Boruto, Sarada sees him as a stupid kid ... will not it? A mysterious young man who appeared in front of Boruto. After being transferred to the academy, he began to study in the same class as Boruto. It is a shinobi with a beautiful aspect, which attracts others. Previously he went to a mission related to Boruto ?. The son of the leader of the village of Konoha, the Seventh Hokage Naruto Uzumaki. A boy with a rebellious character, who does not take seriously his studies in the Ninja Academy and frequently jumps them. He is a good friend, who also consider him a genius. When Naruto is too immersed in his work, there are differences between them. He does not like to be called "son of the seventh", so he wants to show people that he goes his way. A close friend of Boruto. He always left with Boruto before his entrance to the academy. Often involved in pranksters together. Unlike his father, he does not use the term: "how troublesome!" As a phrase during a conversation. He has great intelligence and often helps Boruto. Boruto's classmate and friend of Sarada. She loves to eat chips and handsome guys. She is optimistic, sure of herself, thinks like an adult woman. Friend of the childhood of Boruto. Sharp-tongued and often speaks with sarcasm, but for some reason, it is difficult to feel hatred. Edited by Tokoya, 12 March 2017 - 10:44 PM. Edited by Blue22, 12 March 2017 - 10:14 PM. The 2015 movie “Boruto: Naruto the Movie” which opened to us the world of Naruto’s next generation is finally coming to the TV screen as a series! With the peaceful and modernized Hidden Leaf village as the stage, the son of Naruto the 7th Hokage, Uzumaki Boruto is running rampant, you know! 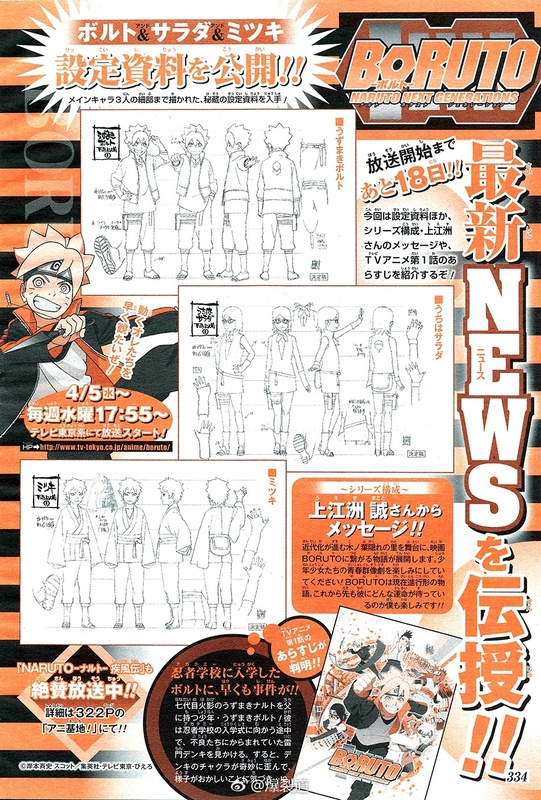 The tale begins when Boruto enrolls at the school that raises ninjas – “Ninja Academy”. Waiting for Boruto are new characters and classmates such as Uchiha Sarada and Nara Shikadai and other next generation groups, who all have parents who have achieved greatness, and have their own personalities. They will all mature as they meet and acknowledge each other. In the academy where ninjutsu are a regular, what kind of events will Boruto encounter? Let us all await this tale of a new legend! To the next generation of the shinobi tales. (Unable to read text)… has been drawn but, the most surprising is the changes in the interior of the Hidden Leaf village. The public transport has begun operations and is becoming ever more like a thunder car, and is almost indistinguishable from the modern town. Occupations other than being a shinobi have been created, and even in the Academy, there will be classmates who have never touched ninjutsu. Since the first series of “Naruto” was released in 2002, it’s been 15 years already. Over this extended period of time, Naruto and his friends have fought in tremendous battles that the fate of the world rides on, there have been dramas involving characters who are linked deeply to the history and origin of the shinobi, and the world of “Naruto” has become deeply secretive (TL note: I’m fairly sure this part is translated correctly, but it’s not making sense to me). Therefore this time we don’t want it to become “Naruto 2.0”. We want to create a new work that our fans, who have followed us these 15 years, and now grown into adults and their children can enjoy. Of course, this is on top of also including the characters that are already a part of the series. We as the staff of “Naruto” refer to Naruto and Sasuke as “legendary characters”, and it’s awesome when they appear in the story, but we are careful to portray Boruto and the next generation as the main characters as we are creating the series. The tale begins a little before the events of the movie. 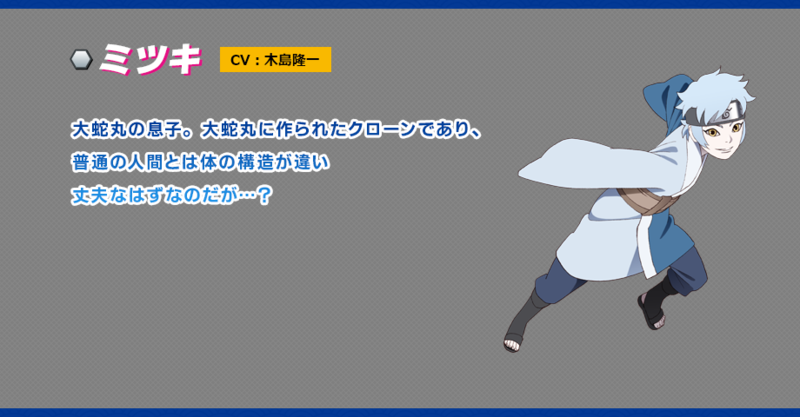 The movie occurs when Boruto, Sarada and Mitsuki are in a three-man cell and undertaking the Chuunin Exams, but the TV series will begin from when they enroll into the Academy. After graduating and forming their three-man cell, gaining experience and challenging the Chuunin Exams is the approximate timeline. Indeed. As the story advances you’ll be able to see the serious side of the world that has been drawn in “Naruto”, but in the early stages it is a school drama with ninja action. Though not developed, this story will be focused on the development of the ninjutsu loving children even as they get lost about the future. This person is an adult but, Shino. Where he has ended up at, and what sort of connections he will have with Boruto is something to look forward to. Also Boruto’s classmates too. Aside of Boruto and his friends’ growth and action, this tale has another axis that it is focusing on. Continuing on the flow of “Naruto”, we believe this tale can be enjoyed by newcoming fans as well. The legendary characters who have now become adults and their connection with the younglings can also be enjoyed. Edited by Tokoya, 12 March 2017 - 11:17 PM. This person is an adult but, Shino . Where he has ended up at, and what sort of connections he will have with Boruto is something to look forward to. Also Boruto’s classmates too. Boruto, but even younger and dumber than he was when you first learned to hate him. i want to see why buroto thinks he is so smart. He claims he doesn't need hard work but i find nothing special about him. They're all boring except for Chocho. I don't see the use in watching a bunch of 6 years old learn basic jutsu, but Chocho's profile said she knows a jutsu called "Butterfly Transformation" Which sounds like she can already use calorie control and summon butterfly wings without diet pills? That's enough for her to pose a threat to jonin if she can do that. But if we're talking stats, she's the least impressive lol, what? Edited by Tokoya, 16 March 2017 - 10:25 PM. I think what we got so far was enough to give us a base idea of who they are and such. What'll be more to the interest is that which will come in time and how they develop along the way to these events. Rather than backtracking for us (once again, only this time even further) to just get even more of an idea of who they are before they get to the point where the adventure begins. More characterization and fleshing out could easily take place in any number of locations besides an academy. It really doesn't though. At least, it doesn't guarantee anymore characterization than we've already gotten. At best, it guarantees more appearances, which can lead to further development. It also, just as you claim for the out of school setting, depends entirely on what the writer takes the time to actually focus on. The main character is then limited in terms of his own development, since this has to end with him still being the exact same person he was at the time the film took place, which really goes for the rest of the new cast as well for that matter. For Boruto, this is nothing more than a step back in character, since we've already seen him move beyond this point. Keeping a cast in one setting also limits the different types of events, interactions, and development that can take place, since you only see them within that setting. Outside of character, it further limits the amount of action and excitement that can take place, along with the locations that we can actually see. There's then the fact, as I mentioned to begin with, that's it's just silly to go back to an academy setting after everything the previous series and the film has covered to this point. That's akin to Dragon Ball Super going back to Goku fighting the Red Ribbon Army, or even having Gohan or Goten fight them this time around. Edited by Ace1225, 22 March 2017 - 09:52 AM. "It also, just as you claim for the out of school setting, depends entirely on what the writer takes the time to actually focus on"
"since this has to end with him still being the exact same person he was at the time the film took place"
"akin to Dragon Ball Super going back to Goku fighting the Red Ribbon Army"
We could see more missions that led to other clans still focusing on training (their stories) - and more about the Otsutsuki clan - who was the other clan member killed? If you guys haven't seen Naruto Shippuuden 500 (officially the last episode of the series), some of the answers are heavily hinted at in the last few fillers (the wedding arc). Since Boruto Next Gen is itself filler spin-off, those last few Shippuuden fillers should probably be considered a bit more seriously. which is completely unrelated but made me smile.